On 21 January, the Rotary Club of Cranleigh held the local round of Rotary’s public speaking competition, “Youth Speaks”, at Cranleigh School. Three intermediate teams and three senior teams from local schools competed for places in the next round. The subjects were varied and well presented, and the adjudicators, Celia Stanton, Wendy Dunnett and Mark Lebus, had a very difficult time deciding the winning teams. 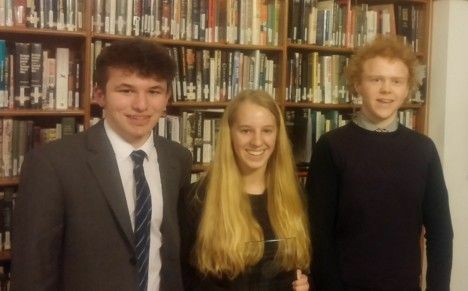 Eventually, they decided that Cranleigh School would go through to the next round in the intermediate section and Godalming College progressed in the senior event. The Cranleigh School Intermediate team members were: Sophie Howard (Chairperson), Ellie Black (Speaker) and Benjamin Chesser (Vote of Thanks). The Godalming College Senior team comprised: Annie Simons (Chairperson), George Chantry (Speaker) and Eamonn Lynch-Bowers (Vote of Thanks). The adjudicators made a special commendation to the Speaker in the Glebelands School Intermediate Team, Lucy Dymott-Brown, who stepped in at the very last moment after the original speaker went home feeling ill.
"The Rotary Club wishes to thank Cranleigh School for their hospitality, the adjudicators, and the schools and parents who supported the competition,” said the event organiser, Rotarian Michael Hart. Photo caption: The winning team from Godalming College. Chairperson: Annie Simons. Speaker: George Chantry. Proposer of vote of thanks: Eamonn Lynch- Bowers.